Stores need more notice, they decide, on ordinance requiring locks on all carts. Abandoned shopping cart on N. 6th St. Photo by Nik Kovac. A proposed ordinance that would require shopping carts in the city to have a locking mechanism was sent back to the Public Safety & Health Committee for further debate. The legislation, introduced by council newcomer, Ald. Chantia Lewis, was referred back to committee because many Common Council veterans couldn’t believe there wasn’t widespread opposition from stores. Lewis sponsored the measure because she has found that recovering abandoned shopping carts has become a daily activity for the Department of Public Works. “This is in response to the shopping carts that have become an unnecessary blight on the community,” she explained. Using the example of a Save-A-Lot store in her district, she said the up-front cost of the carts is from $125-$150/each, while the security system costs $25 per cart. “This is not a costly investment to protect your investment,” the northwest side alderwoman said. Other security options listed in the legislation include the security deposit method associated with Aldi’s, the installation of bollards or other barriers to prevent their removal or the installation of “devices to disable and render inoperable any cart removed from the cart provider’s premises.” One such device used by some Milwaukee stores is a magnet that locks on the cart when it crosses an invisible barrier on the property’s perimeter. Lewis notes those locks have varying degrees of success. “I recognize the problem and sometimes solutions can create new problems,” Kovac said. He along with many others on the council advocated further debate on the measure. Council members Michael Murphy, Robert Donovan, Bauman and Kovac all said they weren’t sure if written notice had been given to those potentially affected by the legislation. With no formal answer available other than Lewis’s assurance that she hasn’t received negative feedback, Kovac and Donovan both moved for the measure to be referred back to the Public Safety and Health Committee and affected parties to be properly noticed of a public hearing. The move unanimously passed. The legislation will likely have a public hearing at the Public Safety and Health Committee on December 7th. If the committee takes action on the item, it could be back before the full council on December 19th. Current regulations in the city require shopping cart owners to mark the carts with their name and address. Abandoned carts recovered by the city become city property after five days if they remain unclaimed. Kovac with the saved shopping cart. Photo by Nik Kovac. 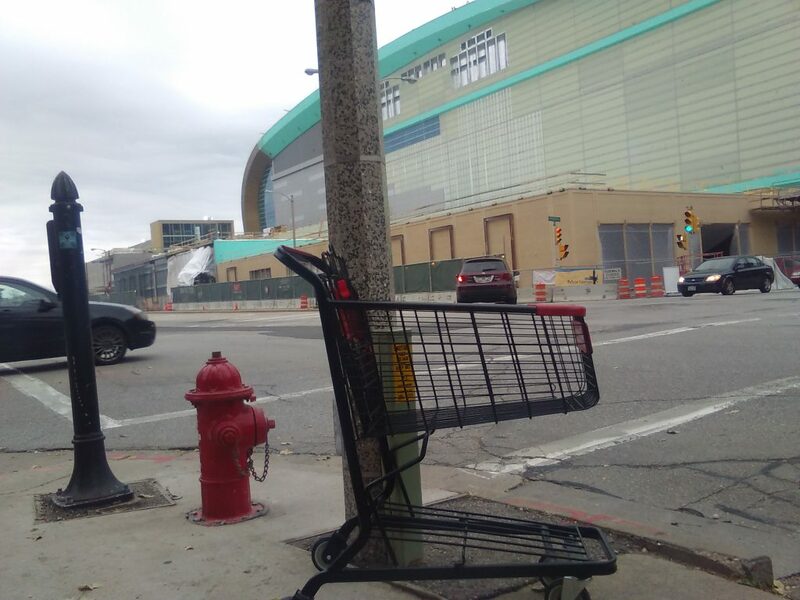 One thing that Lewis referenced repeatedly in today’s meeting was a cart that has sat for days on the corner of N. 6th St. and W. Highland Ave. Kovac, in a moment of levity, promised to go claim it before lunch. He had previously told the council that his second job was at Otto Wenz‘s Sentry on N. Downer Ave. (now a CVS store) and that he enjoyed the diversion of being dispatched to retrieve carts Wenz would spot in the neighborhood. 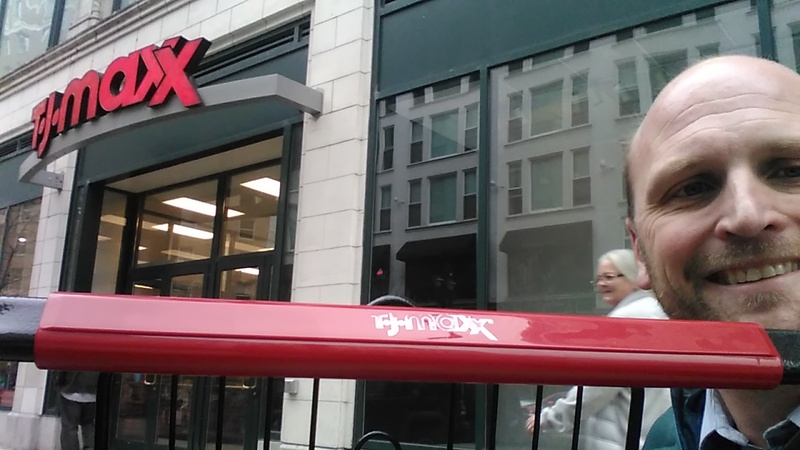 True to his word, as I finished my lunch Kovac was texting me photos of the cart being returned to T.J. Maxx at the Shops of Grand Avenue. The alderman is on the job. I can see it now the “Rumba Shopping Cart.” If it sits idle for more than 10 minutes, it drives it self back to the cart corral. I propose we fine the stores for any shoplifting they allow to occur where the product or packaging is later discarded as litter. Seems equivalent. Didn’t realize this was a problem! Why don’t those who find the carts just wheel them back to the store they’re from? How far away from the stores are these carts wandering?? Wouldn’t it be cheaper for stores to offer an incentive for their regular shoppers who return an AWOL cart, like $25 off your next grocery shop of over X amount… versus spending $25 on every cart in the store? OR wouldn’t it be cheaper for stores to schedule an employee to spend 1 hour driving thru the neighborhood a couple times a week, seeking and retrieving any runaway carts (cuz they aren’t making $25 an hour!) OR people can easily enough use neighborhood apps like Nextdoor to report the cart locations to the store, OR the store could use Nextdoor to report locations their carts were seen, and each person who returns one of the listed carts gets a grocery voucher or something. Seems like there could be a much cheaper solution using creative thinking. Amy, you mean like the 25¢ deposit required on Aldi or Save-a-Lot carts? It works and others return the cart to claim the quarter, that is what this ordinance would require. I think we should BAN ALL SHOPPING CARTS. If we could only save one bus station from having a shopping cart nearby – it would ALL BE WORTH IT!!!!! When I was a kid in the 70’s, the local Kohl’s food store gave us neighborhood kids candy bars for returning carts to the store. That was incentive enough for us and it worked! If shoppers would take responsibility for using a cart, there would not be a problem. Seems people today only care about what’s good for them – screw anyone else.